Students from all disciplines at Texas A&M’s College of Architecture will design and build a single-family residence during the 2012-2013 academic year in a subdivision near downtown Bryan as part of the new collegewide Real Projects initiative. 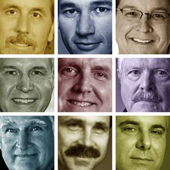 Pioneering designers, an entrepreneur, educator, an advocate for the landscape architecture profession and a leader in the animation industry have been named 2012 outstanding alumni by Texas A&M’s College of Architecture. Throughout the 2012-13 academic year the Texas A&M College of Architecture is celebrating a "Year of Diversity" with a variety of projects and special events spotlighting the value of cultural diversity and its relevance to the disciplines taught at the college. 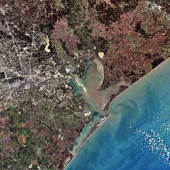 A new research institute dedicated to a better understanding of establishing sustainable and resilient coastal communities, places and landscapes will combine resources of the College of Architecture and Texas A&M University at Galveston. 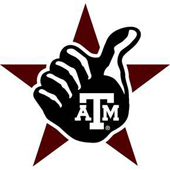 Tom Owens was a sophomore construction science student at Texas A&M in the early 1970s when he heard John Harris '54 present a lecture that changed his life. Harris spoke about the key role of developers in creating communities, motivating Owens to enter the field when he graduated in 1973. Grass grows under boat docks at Lake Conroe during the 2011 statewide drought. Though ranked as one of the fastest growing counties in the nation for the last two decades, groundwater-dependent Montgomery County, Texas is confronted with a looming water crisis that threatens its future growth, according to a recent study by urban planners at Texas A&M University. The study investigated how increasing regional demands for water from Lake Conroe, the county's primary surface water source, and resulting reductions in the recreational lake's water level might impact the area's economy. Though researchers found that anticipated lower lake levels present a threat, limited primarily to the lake-area economy, they said the impending regional water crisis poses a more significant peril to the county's longstanding prosperity. 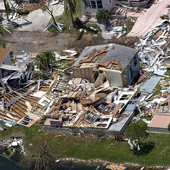 Researchers at Texas A&M's Hazard Reduction and Recovery Center are investigating why the proliferation of hazard mitigation planning by local governmental agencies in disaster prone regions along the U.S. Atlantic and Gulf coasts has not significantly reduced their vulnerability. The impact of acoustics on autistic students’ learning is being studied by Shireen Kanakri, a Ph.D. architecture student. 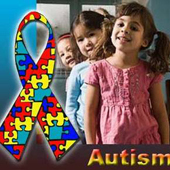 Planning and designing a classroom to address the auditory sensitivity of autistic students is critical, she said, but there has been little architectural research in this area. 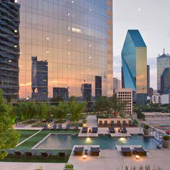 Three Texas A&M researchers have joined an elite group of 10 research teams in an effort funded by the Landscape Architecture Foundation aiming to make the concept of landscape performance and its contribution to sustainability as well known as building performance is today. Sustainable methods for reducing pollutants in stormwater runoff are being developed and tested by Ming-Han Li, associate department head at Texas A&M’s Department of Landscape Architecture and Urban Planning, with the help of $1.8 million in grant funds. Design and planning students at Texas A&M envisioned turning the downtown Rhine riverfront in Bonn, Germany into a destination for residential and business development and tourism during a fall 2011 study abroad studio. 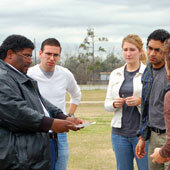 A declining public housing development in Beaumont severely damaged by Hurricane Rita in 2005 has been rebuilt through a federal grant into a successful, sustainable community, concludes a study headed by Shannon Van Zandt, interim director of Texas A&M’s Center for Housing & Urban Development. 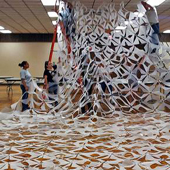 Intricate 3-D latticework crafted from polymer sheets hung from the wall and ceiling of the Brazos Center ballroom provided a celebratory atmosphere for a July 14 scholarship gala hosted by the Hispanic Forum of Bryan/College Station. The ornamentations incorporated more than 10,000 elements. 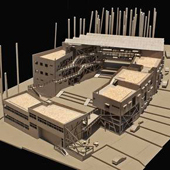 While exploring architectural themes related to place and sustainability, students in two design studios taught last spring by architecture professor Phill Tabb developed intricate models for a sustainable living learning center in Georgia and a mixed-use development in College Station. Texas A&M’s Master of Land and Property Development degree has undergone changes that two leading real estate scholars said would make the program one of the most competitive of its kind in the world. 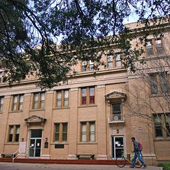 Graduate and undergraduate students can maximize their career options by combining degrees in several accelerated programs offered by three departments at Texas A&M University's College of Architecture. Two U.S. tourists traveling in London last spring were so grateful for the help they received navigating the city's Byzantine subway system, that they penned a letter praising their benefactors, Texas A&M construction science students Colin Spencer and Ian Stephenson, and sent it to Joe Horlen, head of the construction science department. 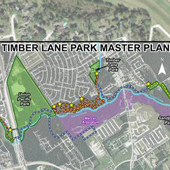 The July 13 dedication of a new park in Spring, Texas culminates a four-year, award-winning park system design project undertaken by Texas A&M landscape architecture students, a prime example of participation in the university's Education First program. 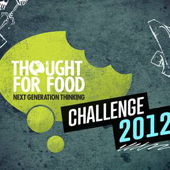 An eco-park concept aimed at reducing food waste through public education and demonstrations, developed by an interdisciplinary Texas A&M student team, netted first place in a worldwide contest seeking solutions to the world’s most pressing food issues. 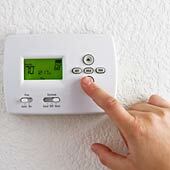 An energy-saving thermostat and high-tech clothing tags that take the guesswork out of washer and dryer settings were among the award-winning ideas hatched by College of Architecture students in a contest sponsored by the Mays Business School’s Center for New Ventures and Entrepreneurship. Honoring a 25-year career advancing the art and science of ecological design and planning, Forster Ndubisi, head of Texas A&M’s Department of Landscape Architecture and Urban Planning, has been elevated to fellow of the American Society of Landscape Architects. A major exhibit showcasing the extraordinary work by emerging architects from Spain, where architecture became a global point of reference by the end of the 20th century, will be on display in the Wright Gallery at Texas A&M’s College of Architecture Nov. 6 – Dec. 10. 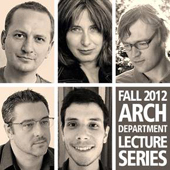 A diverse group of leading architecture practitioners and academics will share their knowledge during the Fall 2012 Architecture Lecture Series at Texas A&M. The lectures, open to the public, begin at 5:30 p.m. in the Preston Geren Auditorium, located in building B of the Langford Architecture Center. 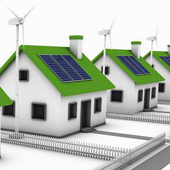 Chris Duerksen, a nationally known proponent of adopting community development codes that directly address sustainability issues, headlined “Imagining New Futures,” an annual urban planning workshop, Nov. 15 – 17 at Texas A&M. 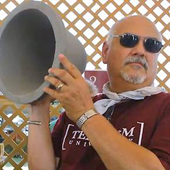 The Colonias Program at the Texas A&M College of Architecture is increasing the availability of potable water to residents of colonias, impoverished communities in the Texas border region, as a partner in the Texas Water Project. 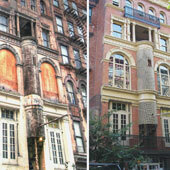 An 1889 row house in New York City's East Village with a striking façade has been restored to its former glory by Lorie Riddle ’93 and a team from her firm, Superstructures Engineers and Architects. 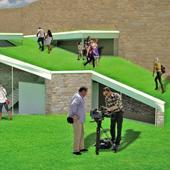 The project won an award from a New York conservancy group. 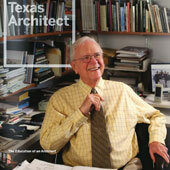 Frank Welch ’51 recounts the emphasis on Modernism in Texas A&M’s architecture program as well as learning experiences outside the classroom in the first chapter of his unpublished memoir, the cover story of the January/February 2012 issue of Texas Architect. 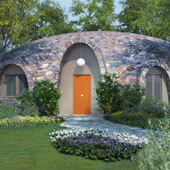 Concrete dome homes could be widely implemented as the perfect solution to housing dilemmas throughout the world, said Douglas Stanton ‘82, a former Texas A&M environmental design student, at a May 2012 alternative building materials and design expo in California. 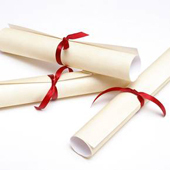 Former students are invited to submit items for our Class Acts features and news briefs, which highlight professional achievements, as well as news briefs about marriages, births, retirements and whatever else former students care to share with the college community. News and photos may be e-mailed directly to the editor. CEO of REES Associates Inc. Kids had fun at Camp Arch and VizKids camps July 8-13 learning about careers in disciplines taught at the College of Architecture. Camp Arch students participated in workshops including drawing and design software and photography, took a tour of the Bonfire memorial and cooled off in a College Station water park. 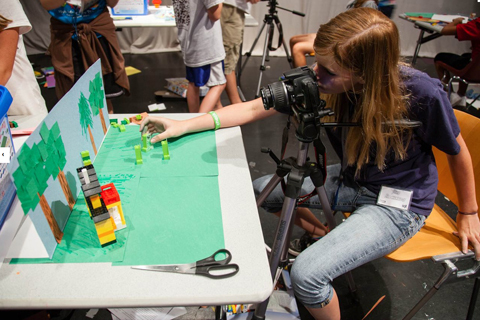 VizKids campers were introduced to visualization sciences with instructional, hands-on classes, enriching presentations by industry pros and fun social activities. see story and video.